Anonymous sale; Sotheby's, New York, 23 October 1998, lot 381. 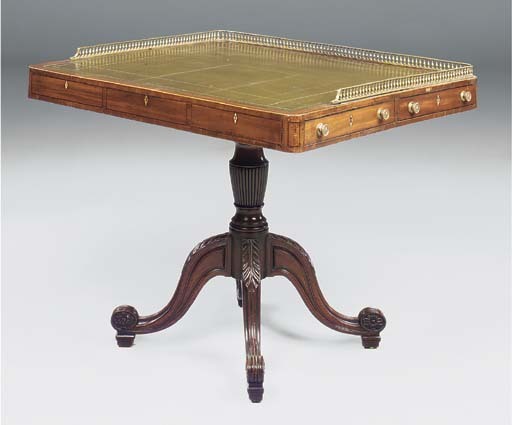 The brass-railed writing-table with reeded 'vase' pillar on an 'Apollo' palm-wrapped 'claw' terminating in flowered volutes, reflects the French antique fashion promoted by Thomas Sheraton's publications around 1800. A related leather-topped and galleried table was supplied at this period for Southill Park, Bedfordshire (G. Jackson-Stops, 'Southill Park', Country Life, 28 April 1994, p. 66, fig. 9). A similar quadripartite base pedestal table with gilt-enriched base and possibly designed by Henry Holland for Francis, 5th Duke of Bedford, is at Woburn Abbey, Bedfordshire (see 'The Racing Room', Woburn Abbey [Guide], 1987).